If there is one job I detest, it’s mowing the bloody lawn. If I had my way, I’d cover the garden with asphalt, but the missus thinks that grass is nice so I’m not allowed to do that. Something else I don’t like is the lawnmower. It’s been a good piece of kit but it has seen better days and frankly, it should be put out to grass. Pardon the pun. However, looking at it from a purely mechanical point of view, the motor is good, starts relatively easily and has been a good runner. The chassis and wheels though, are another kettle of fish. The rear wheels are wobbly to the extreme and the chassis is getting old and rusty. The choke lever went years ago and, to start the machine, I have to hold the choke open with a length of string. I should replace it, but I’m a stubborn old git at the best of times so I decided to fix her up. The main problem was the wheels. They are mounted on stub axles and the chassis has weakened to the point where it can’t hold the wheels upright any more, causing them to rub on the frame and impede my forward momentum when mowing the bloody lawn. I decided to strengthen the mounting point by placing some big washers at either side of the frame where the axles fit and tighten up the locking nuts to squeeze the assembly together. Brilliant. Well, it would have been brilliant, but the axles and retaining nuts were so rusty that in my attempt to loosen them, they both snapped. Cheap chinese bolts. Shite. This forced me into the iShed to find replacement bolts, which I don’t have. I do have some ten millimeter stud though and some lightweight tubing that fitted through the wheels and would accommodate said studding. Hacksaw at the ready, then, I cut both tube and studding and fashioned new axles. Joy of joys, they fitted and the job was a good ‘un. The lawnmower travels easily now and with no more rubbing of wheels on chassis. The blade wasn’t looking too good either so I removed it, since I was under the machine anyway, and took it to the iShed to grind a new edge on both ends of the blade. That went well and soon I had refitted it and bolted it neatly onto the drive shaft. Having the thing the right way up now on the new wheels, I looked at the engine. The motor. Call it what you like. Very little oil on the dipstick. I have lawn mower oil somewhere. SAE30, if I remember rightly. I found it and topped up the crankcase. I fueled the thing while I was at it and filled her up with 95 octane. I can’t really do anything about the choke yet. I need to design and build a lever affair that will allow me to connect a wire to both lever and choke lever on the carburettor, so my string will have to do for now. I cleared up all my tools and put them away. I cleared up in the iShed. All I needed to do for my own satisfaction was to mow the lawn after all my efforts fixing up the mower. I went back to said mower, adjusted my string choke, grabbed the throttle control and pulled on the starter cord. It fired up immediately. Success. And just as I was ready to go… it started to rain. I hate mowing the bloody lawn. Behold. The iShed is Finished..
And bloody marvellous it is too.. Finally, I have the shed I always wanted. I built it, mostly alone. Therefore, I call it The iShed. It is insulated against the elements. It has heating. Electricity. A flagstone floor and a workbench. Building it has been a labour of love and a herculean one at that. It took me weeks of endless screwdriving, pushing and pulling and hauling of lumber, Rockwool, sand and concrete flagstones. My laptop computer can even find the house WiFi connection from the bench. I have a radio out there for company while I’m working. Lighting and sockets for my power tools and I’ve put shelving units up for spares, tools and other stuff that gets stored in The iShed, like the Weber grill and some garden furniture. For good measure, I have a thermometer and a hygrometer mounted on the wall. Climate control. Can’t have Thumper rusting, can I? The woodpile is housed under the extended shed roof. Enclosed on three sides, dry and airy, the wood is well stored there and there is room for me to stand in the shelter of the roof and cut, chop and stack wood for the stove. There’s even lighting out there too. I did have one little problem. After it had settled, the tar membrane roof covering developed a small leak or two. It had bulged up at one or two points along two of the seams between layers. It took me a while to find them, but once that was done, I sealed them up with cold tar and recoated the outside of the seams with the same gooey black stuff. Now it doesn’t leak any more and, if it ever does again, I know what to look for and I know how to fix it. One expects teething troubles. I’m glad I found them now and not in the middle of winter. Here’s a couple of pictures. I’m afraid I didn’t take many. I should have taken a load of ‘em.. 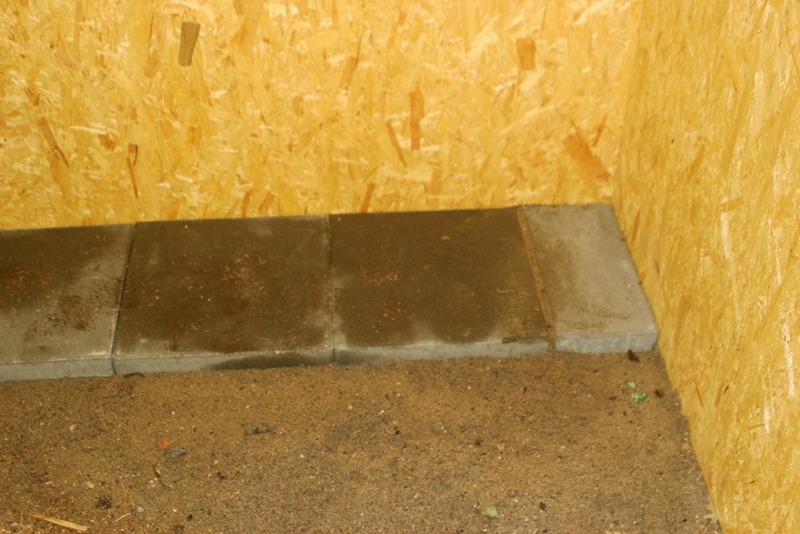 The first one is of the flagstones going in, the second is of the workbench, which I built from scratch. The bench top is a cheap kitchen counter top, cut to length, and it affords me a great surface to work on. The drawers are an old kitchen unit, removed from our kitchen when we had the dishwasher installed some years ago. I have about seven square metres of floor space, room for Thumper and a bit more, including the garden tools. I painted around the workbench to give a bit more light to that area. 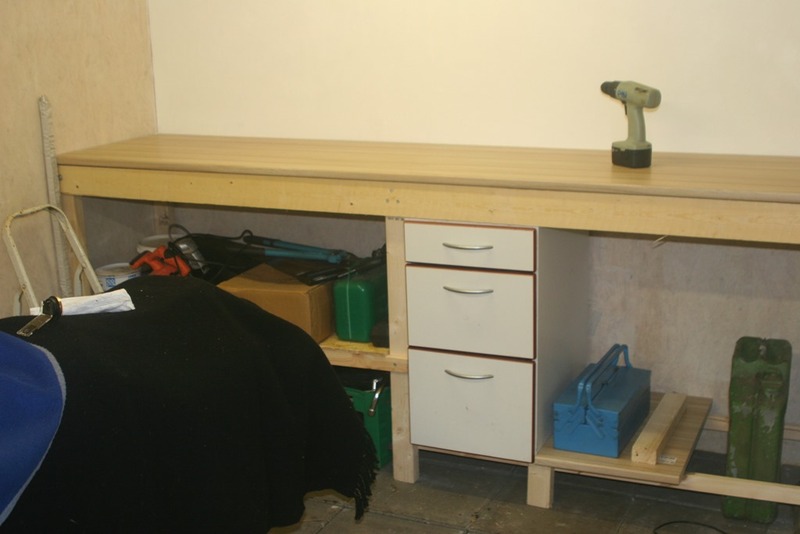 I have since installed a bench vice and moved my bench drill and a grinder in. I intend to install another cabinet with more drawer space at a later date. I have a mini fridge for beer. It’s not installed yet, but give me time enough and I’ll get round to it. It’s organised, dry, warm and generally a pleasant place to stand and work in. I’m pleased that Thumper has a secure place to be kept in, that my tools are gathered in one place and that I have a place to retreat to when I have some great project in mind. Hail The iShed. It was worth all the effort, sweat, pain, work and expense. Every man should have one.